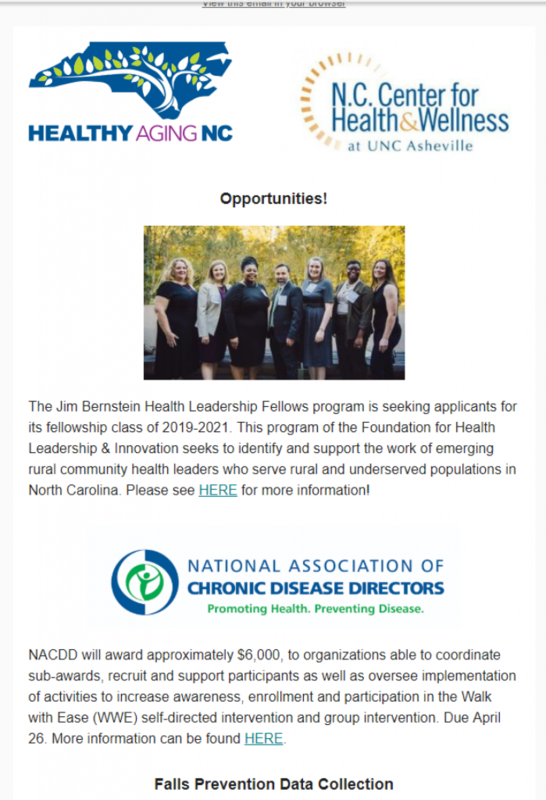 Healthy Aging NC has a monthly bulletin, and you can find April’s news HERE. Sydney began UNC Asheville in the Fall of 2018 as a sophomore. Her major is political science with a focus on American Government. She holds the Communications Specialist student employment position for the NC Center for Health and Wellness’s Healthy Aging NC Initiative. Q: What are your job tasks with the Healthy Aging NC Initiative of the NC Center for Health and Wellness? I have been co-leading a program called Walk With Ease—last semester I started to help coordinate the program and learned about it, now I am trained in it and am a facilitator. I do a lot of Facebook posts on the Healthy Aging NC page about aging and arthritis. I also have various tasks, it depends on the week—I have done some powerpoint development, some research, some data entry, and testimonials of past program participants and leaders. Q: Why do you think this job and the Healthy Aging NC Initiative is important? The Healthy Aging NC Initiative offers things that work and are effective. There are programs that are evidence-based and help people feel better. I am learning about myself and my own chronic illnesses while learning about these programs. Even doing Walk With Ease has been hard for me, walking can be a struggle for me. I thought I would have trouble relating to older adults as a college student. But going through my own experiences, it has given me an appreciation of what we are doing. Q: Did you hold any stereotypes about working with older adults? Has that changed at all? I did hold some stigmas that I think a lot of people my age have. You worry that older adults will look down on you because you are young. I even thought that they may be rude and crotchety, but I have not had that experience. Everyone has been respectful and receptive to what I have to say during Walk With Ease and my other communications. Q: How does this job pertain to your future? Part of what I care about going into the Political Science field is health care. 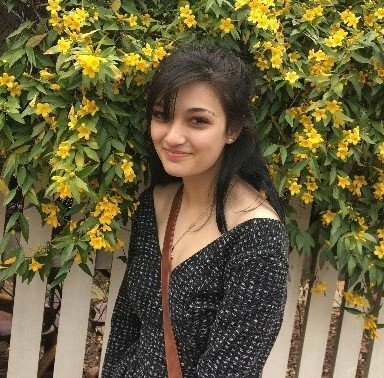 Being someone who struggles with chronic illnesses myself, I would like to help in initiating some form of truly affordable healthcare for all Americans. Everyone deserves the right to get the help they need and when you’re sick the last thing you need to worry about is how you’re going to pay your medical bill. Congratulations to the High Country Area Agency on Aging for winning honorable mention in the National Council on Aging Falls Free® photo contest. With over 100 entries submitted, we are proud to have a photo from our network among the winners. An announcement with all the winning entries will be shared by NCOA next week. Being physically active is one of the most important things that people of all ages can do to improve their health. The latest edition of the Department of Health and Human Services “Physical Activity Guidelines for Americans” is clear: physical activity promotes growth and development and can make people feel better, function better, sleep better and reduce the risk of chronic diseases. Health benefits start immediately after exercising, and even short episodes of physical activity are good for you. Even better, research shows that just about everyone benefits: men and women, people living with a chronic condition or disability, young children and older adults. The key guidelines for older adults focus mainly on two types of activity—aerobic and muscle-strengthening and an entire chapterfocuses on older adults beginning on page 66. Check out all of the information athttps://health.gov/paguidelines/second-edition/pdf/Physical_Activity_Guidelines_2nd_edition.pdf. The evidence about the health benefits of regular physical activity is well established, and research continues to provide insight into what works to get people moving. 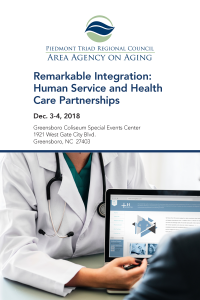 Piedmont Triad Regional Council Area Agency on Aging is pleased to partner with Northwest Area Health Education Center (AHEC) to offer the premier Remarkable Integration: Human Service & Health Care Partnerships Conference December 3 & 4, 2018 at the Greensboro Coliseum Event Center. This conference features national, state and local speakers on topics that will address social determinants of health (Healthy Opportunities) and partnerships between human services and healthcare organizations. One of our conference speakers, Dr. Adam Zolotor, President and CEO, North Carolina Institute of Medicine stated, “Bridging healthcare and human services is timely and appropriate.” As we continue to serve many more seniors, we must look to diversifying revenue. Please register online here. Step by Step instructions for registering online. The conference will provide up to 11.5 contact hours from Northwest AHEC. Concurrent with the conference we are offering a no cost Caregiver Expo for the public. Conference attendees can also spend time visiting exhibitors during the two-day time-frame. 2018 Falls Prevention Awareness Week! North Carolina’s annual Falls Prevention Awareness Week (FPAW) September 24-29 raises awareness about how to prevent fall-related injuries among older adults. National, state, and local partners collaborate to educate others about the impact of falls, share fall prevention strategies, and advocate for the expansion of evidence-based community fall prevention programs. National and state efforts are published in National Council on Aging’s annual Impact Report. Please complete the 2018 Falls Prevention Awareness Events Survey (opens in new tab) about your Falls Prevention Awareness, Day, Week, or Month activities. Events will be posted on HealthyAgingNC.com this month. You can find updated events (as we receive them) every week in the programs tab through September 28, 2018. If you create any shareable media, or have FPAW news to share, please send them to HealthyAgingNCinfo@gmail.com by Sept 17 so we can post them to the News feature of our website. If you haven’t planned any Falls Prevention Awareness Day activities, fear not! You can check out North Carolina’s webinar on Falls Prevention Awareness Week resources here: Webinar. 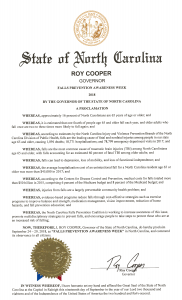 We look forward to celebrating North Carolina’s Falls Prevention Awareness Week with you! For more details, please check out the full post at the link above! 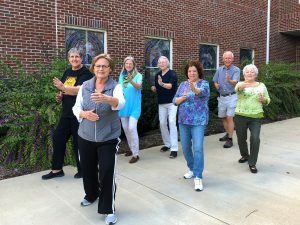 Updated A Matter of Balance and Tai Chi for Arthritis data collection forms and materials from ACL/NCOA are now available on the Healthy Aging NC website under the Resources tab, Trainer Resources selection. They are designed for de-identified (participant ID only) data collection. Download copies for your next workshop! Scroll down to the lower third of the page and look for the green ‘Updated’ title and the blue ‘New’ button. Don’t forget to View the Forms Instruction Video . Healthy Aging NC Eastern Region Meeting: Connecting great resources in the state! 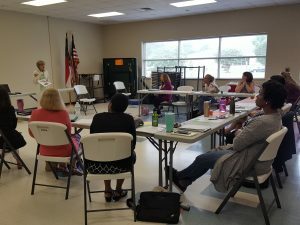 On July 25, 2018 in Pitt County (Greenville), 16 participants from five Area Agencies on Aging and community partners at Vidant, Senior Centers, and Schools and Recreation across the region gathered at the “Healthy Aging NC Eastern Region Meeting: Connecting great resources in the state.” This one-day event was sponsored by the Healthy Aging NC Initiative of NC Center for Health and Wellness. 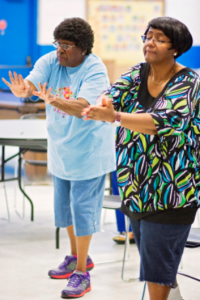 Guest speakers included the NC Center for Health and Wellness, OsteoArthritis Action Alliance, NC Council of Churches, AARP, Eat Smart Move More Weigh Less of NC, and the NC Division of Aging and Adult Services, along with a physical activity break by Centralina. If you would like to learn more about the agenda, guest speakers, or powerpoints, please visit the online Regional Meeting materials.